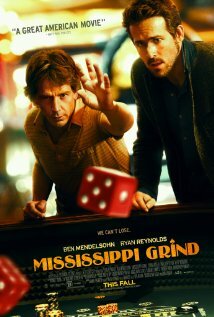 Movie Review: If you’re in the mood for those pungent dramas about losers, gamblers, wanderers, solitaries, and despairing human creatures that inhabit the face of the Earth struggling with financial problems and family disillusions, “Mississippi Grind”, may be a splendid pick. The meritorious performances of Ben Mendelsohn, playing a vicious poker player who ultimately is going through a phase of bad luck, and Ryan Reynolds (replacing Jake Gyllenhaal), as a sympathetic younger gambler who loves to talk to people and charming them with amazing stories about other gamblers, are sufficient motives to follow the film. The disheartened Gerry (Mendelsohn), an absent father and divorced real estate agent whose life is in a complete mess, slowly approaches the Iowan casino where he daily tries his luck. He wants to win so badly, so he can pay his giant debts and regain the confidence he has lost in order to reconnect with his little daughter. While at the poker table, he gets fascinated with Curtis (Reynolds), who immediately draws his attention. Gerry truly starts to believe that Curtis can be the one who can change his luck. Both become friends, setting off on a road trip in which a few interesting encounters and episodes inject some more substance than just the gambling itself. The destiny is New Orleans, but underway, they make a couple of stops. The first is in St. Louis, where Curtis visits his girlfriend, Simone (Sienna Miller), at the house where men can find companionship. Once there, Gerry nurtures a special fondness for Vanessa (Analeigh Tipton), a sweet girl who wants to change her life and enthusiastically shows him some magic tricks. Then, a big bet is waiting for the avid Gerry in Memphis, but once again, he leaves empty-handed. Before reaching the destiny, they make a little detour to Little Rock, where Gerry meets with his ex-wife. Shamefully, he falls into the temptation of trying to steal cash from her. Failure after failure, the two friends are daring enough to sometimes play with their lives. Are they condemned to fail forever? The mood adopted by the American writers/directors, Anna Boden and Ryan Fleck ("Half Nelson"), is reminiscent of Robert Altman’s films from the 70’s, whereas the musical score – a blend of old blues and other westerner tunes – supplies the appropriate flavor to consolidate its dynamics.